UK consumers pay more attention to online videos when they are live than they do to pre-recorded clips, and are also more trusting of the live streaming format, new research suggests. A survey of 2,013 adults for video agency Through The I found that 73 per cent pay more attention to videos if the event is happening while they are watching it. 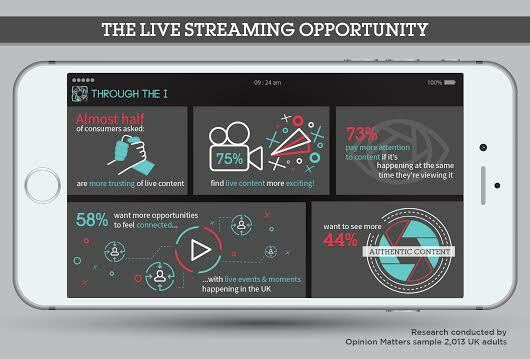 Three in four people find videos more exciting when they are being streamed live, and 58 per cent said they wanted more opportunities to feel connected with live events. What is more, more than half of consumers trust live videos more than those that have been pre-recorded. Scott Jackson, MD of Through The I, said: "With the ability now to stream to even more channels, including LinkedIn, Periscope and YouTube, the opportunities for brands and organisations to engage has never been better." The survey was carried out by research group Opinion Matters.